Overrange kit for high-end engines. Diameter of rear convertor and variator plate are larger than the standard items. 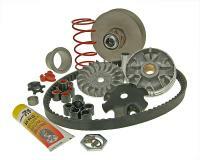 Together with the included drive belt this greatly increases the adjustability of the drive system. Higher top end speed and great performance through the range. 19x15.5mm weights make for quite, yet optimal shiting. All necessary parts included. variator weights in 3.5g and 3.8g for optimal tuning on Malossi MHR-kitted engines. We also offer individual parts for this kit. Attention: Suitable for engines with 3 shoe clutches and a clutch bell diameter of 107mm.